Why add Prosper/BACF to your investment portfolio? Along with great returns and 3 and 5 year terms, Prosper Notes provide many portfolio benefits, ranging from current income to lower interest rate risk. This unique investment opportunity provides meaningful returns without locking up your money for long periods of time. Lending to consumers is a decades-old industry that’s produced profits year after year for a handful of credit card companies and banks. Prosper/BACF provides investors unprecedented access to this market, with consistent returns. See chart below.. 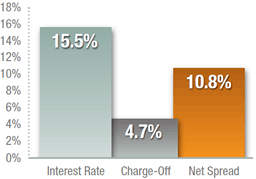 Borrowers make monthly payments of principal plus interest that show up in your Prosper/BACF account. Create a passive income stream, or easily reinvest your cash earnings with our online investing tools like Quick Invest. Diversify your portfolio by adding a new asset class—consumer loans—which is less vulnerable to market volatility than other investments. Along with high-yields and consistent returns, enjoy tax advantages when you open your new or rollover Prosper/BACF IRA. See how fast your retirement savings can grow when you invest your Individual Retirement Account with Prosper/BACF. To open a Prosper/BACF IRA, click the button below. Help hardworking families escape the credit card trap, fund an entrepreneur’s dream, or finance a dream wedding - while earning a healthy return. Through Prosper/BACF, borrowers get fixed-rate personal loans that are smarter alternatives to high-interest rate credit card debt that could take years to pay off. With easy monthly payments of principal and interest to investors like you, borrowers get what they want without getting deeper into debt. Take a look at our loan listings. These are real people with real stories, wants and needs. Prosper/BACF screens and scores creditworthy borrowers who list their loan request. Investors review loan listings, and invest in those that meet their criteria. Borrowers make fixed monthly payments and investors receive their share directly to their Prosper/BACF account. 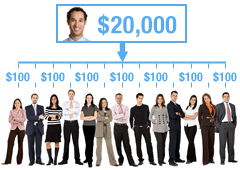 * A minimum of $5,000 is required to open an Individual Retirement Account for investing with Prosper/BACF.